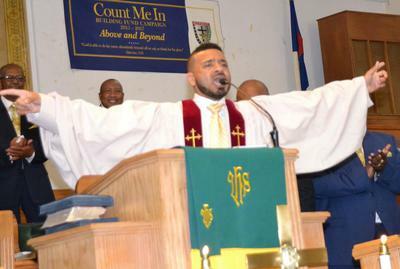 Minister Chris Williams is currently the Youth and Young Adult Minister at Greater Zion Hill Baptist Church in Harlem, New York. He Previously served as Youth Minister at Unity Baptist Tabernacle in Mount Vernon, New York where he was licensed to preach the gospel under the leadership of Reverend Edward Mulraine. In addition, he currently serves as financial secretary to the United Missionary Baptist Association youth and young adult auxiliary. Currently Minister Chris is attending Nyack College and Alliance Theological Seminary and has received his: Associates in Science Degree in Music and Christian Ministry, Bachelors of Arts Degree in Music and Christian Ministry And currently pursuing a Masters Degree in Biblical Studies. Minister Chris has been active and involved in ministry since childhood as a Minister of Music but officially accepted his call to preach the word of God at his home church, Greater Zion Hill Baptist Church in 2011 under the leadership of Reverend Doctor Frank Blackshear. His heart’s desire is to build the kingdom of God and his favorite scripture is (Nehemiah 8:10) “The joy of the Lord is my strength"